Development Tools, Enterprise Java, Java App Dev, Open Source, others, Programing, Scripting and JVM Languages, Spring Framework, by admin. Kotlin originated at JetBrains, the company behind IntelliJ IDEA, in 2010, and has been open source since 2012. The Kotlin team currently has more than 20 full-time members from JetBrains, and the Kotlin project on GitHub has about 100 contributors. JetBrains uses Kotlin in many of its products including its flagship IntelliJ IDEA. You can see that functions are defined with the fun keyword, and that semicolons are now optional when newlines are present. The val keyword declares a read-only property or local variable. Similarly, the var keyword declares a mutable property or local variable. Nevertheless, Kotlin is strongly typed. The val and var keywords can be used only when the type can be inferred. Otherwise you need to declare the type. Type inference seems to be improving with each release of Kotlin. Have a look at the function declaration near the top of both panes. The return type in Java precedes the prototype, but in Kotlin it succeeds the prototype, demarcated with a colon as in Pascal. It is not obvious from this example, but Kotlin has relaxed Java’s requirement that functions be class members. In Kotlin, functions may be declared at top level in a file, locally inside other functions, as a member function inside a class or object, and as an extension function. Extension functions provide the C#-like ability to extend a class with new functionality without having to inherit from the class or use any type of design pattern such as Decorator. For Groovy fans, Kotlin implements builders; in fact, Kotlin builders can be type checked. Kotlin supports delegated properties, which can be used to implement lazy properties, observable properties, vetoable properties, and mapped properties. Many asynchronous mechanisms available in other languages can be implemented as libraries using Kotlin coroutines, which are experimental in Kotlin 1.1. This includes async/await from C# and ECMAScript, channels and select from Go, and generators/yield from C# and Python. Allowing top-level functions is just the beginning of the functional programming story for Kotlin. The language also supports higher-order functions, anonymous functions, lambdas, inline functions, closures, tail regression, and generics. In other words, Kotlin has all of the features and advantages of a functional language. For example, consider the following functional Kotlin idioms. k and v can be called anything. The above examples show the for keyword as well as the use of ranges. Even though Kotlin is a full-fledged functional programming language, it preserves most of the object-oriented nature of Java as an alternative programming style, which is very handy when converting existing Java code. Kotlin has classes with constructors, along with nested, inner, and anonymous inner classes, and it has interfaces like Java 8. Kotlin does not have a new keyword. To create a class instance, call the constructor just like a regular function. We saw that in the screenshot above. Kotlin has single inheritance from a named superclass, and all Kotlin classes have a default superclass Any, which is not the same as the Java base class java.lang.Object. Any contains only three predefined member functions: equals(), hashCode(), and toString(). Kotlin classes have to be marked with the open keyword in order to allow other classes to inherit from them; Java classes are kind of the opposite, as they are inheritable unless marked with the final keyword. To override a superclass method, the method itself must be marked open, and the subclass method must be marked override. This is all of a piece with Kotlin’s philosophy of making things explicit rather than relying on defaults. In this particular case, I can see where Kotlin’s way of explicitly marking base class members as open for inheritance and derived class members as overrides avoids several kinds of common Java errors. Speaking of avoiding common errors, Kotlin was designed to eliminate the danger of null pointer references and streamline the handling of null values. It does this by making a null illegal for standard types, adding nullable types, and implementing shortcut notations to handle tests for null. var a : String = "abc"
If you need to allow nulls, for example to hold SQL query results, you can declare a nullable type by appending a question mark to the type, e.g. String?. var b: String? = "abc"
The protections go a little further. You can use a non-nullable type with impunity, but you have to test a nullable type for null values before using it. To avoid the verbose grammar normally needed for null testing, Kotlin introduces a safe call, written ?.. For example, b?.length returns b.length if b is not null, and null otherwise. The type of this expression is Int?. In other words, b?.length is a shortcut for if (b != null) b.length else null. This syntax chains nicely, eliminating quite a lot of prolix logic, especially when an object was populated from a series of database queries, any of which might have failed. For instance, bob?.department?.head?.name would return the name of Bob’s department head if Bob, the department, and the department head are all non-null. Often you want to return a valid but special value from a nullable expression, usually so that you can save it into a non-nullable type. There’s a special syntax for this called the Elvis operator (I kid you not), written ?:. The designers of Java thought this was a good idea, and it was a net win for toy programs, as long as the programmers implemented something sensible in the catch clause. All too often in large Java programs, however, you see code in which the mandatory catch clause contains nothing but a comment: //todo: handle this. This doesn’t help anyone, and checked exceptions turned out to be a net loss for large programs. 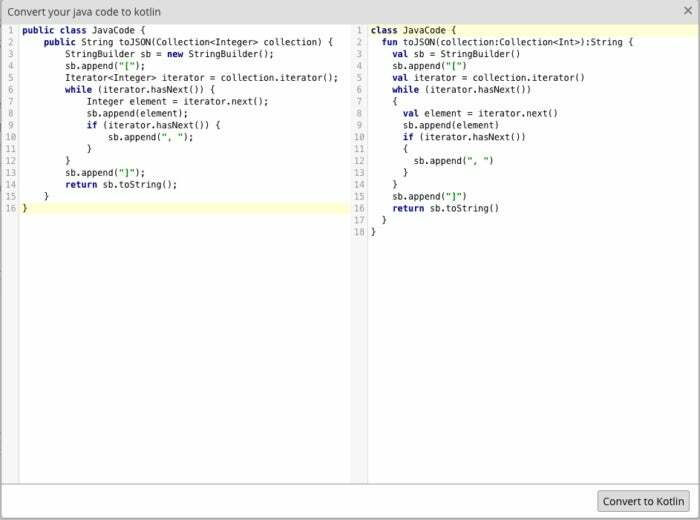 At this point you may be wondering how Kotlin handles the results of Java interoperability calls, given the differences in null handling and checked exceptions. Kotlin silently and reliably infers what is called a “platform type” that behaves exactly like a Java type, meaning that is nullable but can generate null-pointer exceptions. Kotlin may also inject an assertion into the code at compile time to avoid triggering an actual null pointer exception. There’s no explicit language notation for a platform type, but in the event Kotlin has to report a platform type, such as in an error message, it appends ! to the type. This scheme breaks down for the case of Java set-only properties, which are not yet supported in Kotlin. If a Java class has only a setter, it will not be visible as a property in Kotlin. Kotlin’s interoperability with Java extends to Java tools. Kotlin doesn’t have its own editors or IDEs; it has plug-ins for the popular Java editors and IDEs, including IntelliJ IDEA, Android Studio, and Eclipse. Kotlin doesn’t have its own build system; it uses Gradle, Maven, and Ant. This story, “What is Kotlin? The Java alternative explained” was originally published by InfoWorld.